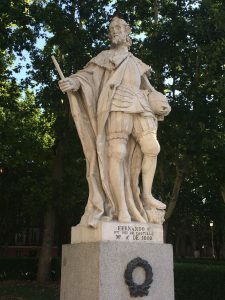 Statue of King Fernando I of Castile outside the Royal Palace of Madrid. However, through a few of my own documented “royal” lines, I end up with a few cases of Spanish ancestry through my colonial British forebears. On our trip to Madrid, we walked through the Buen Retiro Park and outside the Royal Palace of Madrid, both of which have numerous statues of rulers of various Spanish kingdoms (Castile, Aragon, Leon, Barcelona, etc. ), as well as monarchs after unification with the marriage of Ferdinand and Isabella. On a day trip to Segovia, we also saw the Alcázar, which has the Hall of Kings with painted statues of early monarchs of Castile ending with “Juana la Loca,” the well-known daughter of Ferdinand and Isabella and mother of Emperor Charles V.
The easiest way for most people with Colonial American ancestry to connect (via the British royal family) back to early Spanish rulers is through Eleanor of Castile, the wife of King Edward I of England. Two works – Royal Ancestry by Douglas Richardson, and the forthcoming updated The Royal Descents of 900 Immigrants by Gary Boyd Roberts – are useful in determining these connections. While this is by no means one of my genealogical specialties, I’ve enjoyed seeing these various lines of descent for my own ancestors. Roberts’ work is getting updated this year, and so I decided to demonstrate (on the chart below) the way many of the immigrants he includes would have connections to earlier rulers of pre-union kingdoms of Spain. This chart does not outline all Castilian descents (there are indeed many more! ), but it shows how the most recent couples’ various royal lines may begin in Roberts’s work, treating the most recent Spanish marriage (for this reason I also include Isabella of Castile as the wife of Edmund of Langley). In Roberts’ work, before he covers the immigrants descended from Edward III, he reviews those immigrants with descents from more recent kings, i.e., from King Edward IV of England to King Ferdinand I of Romania (died 1927). The large majority of these kings will also descend from Eleanor of Castile and thus share the above ancestry. The other way many British people and Americans of British descent derive Spanish descent is through Sancha de Ayala, the Spanish wife of Sir Walter Blount, which provides an even closer connection to later kings of Spain, as Sancha’s brother was the great-great-grandfather of Ferdinand, husband of Isabella. 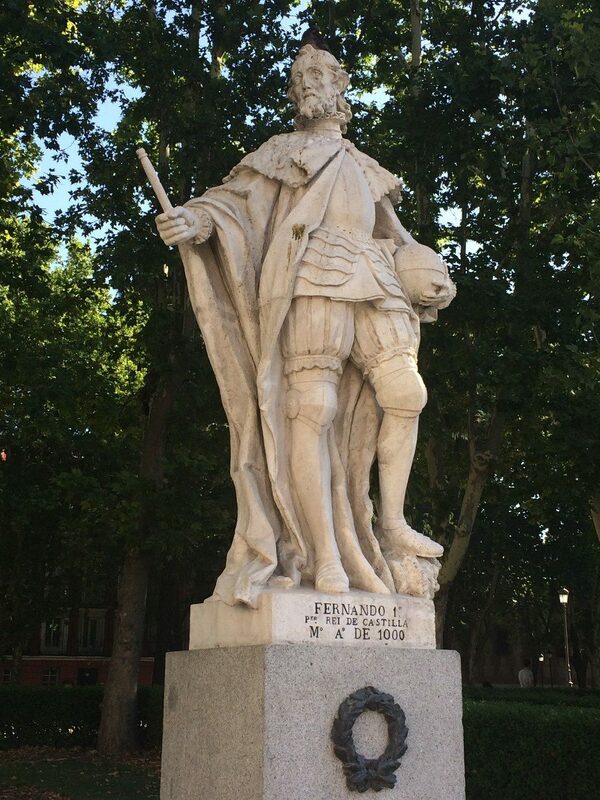 However, nearly all American descendants of Sancha de Ayala will also end up with these earlier Castilian connections, as Sancha herself likely descends from King Alfonso VI above. Sancha’s American immigrant descendants go through her children Thomas and Constance. Constance Blount married Sir John Sutton, who was a descendant of Eleanor of Castile and Edward I. In the 2015 update to the 2012 reprint of Ancestors of American Presidents, Roberts lists 50 American immigrants who descend from Sancha de Ayala, most of whom also descend from Eleanor of Castile. Also on the chart above is Philippa of Hainault, wife of King Edward III of England, who was a great-great-granddaughter of King Jaime I of Aragon (died 1276). This new edition of Roberts includes one rather interesting descent back to Jaime I. The immigrant to the American continents is Alonso Riquelme de Guzman of Paraguay, whose daughter Catalina moved to Argentina. After several Argentine generations, a descendant – Francisco de Paula Lynch Zavaleta (1817–1886), moved to San Francisco during the Gold Rush. 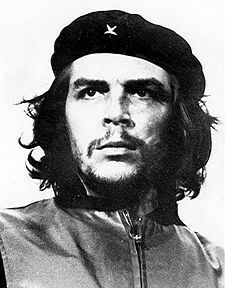 Francisco’s daughter returned to Argentina and was the grandmother of Argentine-born Cuban and Bolivian revolutionary leader Ernesto “Che” Guevera de la Serna (1928–1967). I found this descent online and this was subsequently verified by NEHGS member Thomas Gede. Certainly more such lines likely exist to immigrants in Latin America; thus, many people from parts of the former British and Spanish empires may share not-too-distant kinships. For lines that descend from the sons of Edward I by his second wife, Marguerite of France, Marguerite was a great-great-granddaughter of Alfonso VIII, King of Castile, grandson of Alfonso VII on the chart. For more information on Sancha de Ayala, see Milton Rubincam, “The Spanish Ancestry of American Colonists,” National Genealogical Society Quarterly 51 : 235–38; Nathaniel L. Taylor and Todd A. Farmerie, “Notes on the ancestry of Sancha de Ayala,” Register 103 : 36–48 (an online version of this last also appears here); and the above update by Roberts. Edward and Eleanor are my ancestors, and so are Sancha de Ayala and Walter Blount. All the twists and turns in these ancestries are fascinating, as are their stories. Thank you, Christopher. This helps clarify some of the confusion I have experienced with descendancies from both Edward III and IV… I actually found the list of ‘gateway ancestors’ on the Charlemagne Society’s website useful as to where to start investigating. I’ll enjoy reading these others! Interesting article Chris, thank you. Thanks for this, Chris. The Iberian Peninsula DNA that appears in various amounts in myself and siblings and first cousins has made me wonder about these kind of long-ago or ancient connections. So it will be interesting if I can follow the crumbs back to Eleanor of Castile or Katherine of Aragon, etc. I look forward to Gary Boyd Roberts revision! In most cases, when people with ancestry in the British Isles who test positive for “Iberian” DNA, it probably has to do with the affinity of the coastal regions of Western Europe going back to far ancient times due to trade and migration. “Iberian” DNA is of course chiefly found in Spain, but also in France and as far north as southern Ireland, southern England, and Wales. It’s probably generally “Celtic.” It’s unlikely in the extreme (if not impossible) that Americans with remote descents from Eleanor of Castile or Katherine of Aragon would have inherited any of Eleanor’s or Katherine’s autosomal DNA. In my wife’s case, her “Iberian” DNA apparently came mostly from her nineteenth century ancestors from County Dorset and County Devon. P.S. As for myself, I have a descent from Eleanor of Castile on my mother’s side — but no “Iberian” DNA, so in my line Eleanor’s DNA all washed out long, long ago. Interesting. I think there’s probably something to the old Irish origin myth that claims the Gaels migrated from Spain (Iberia) to Ireland (Ibheriu/Eriu). 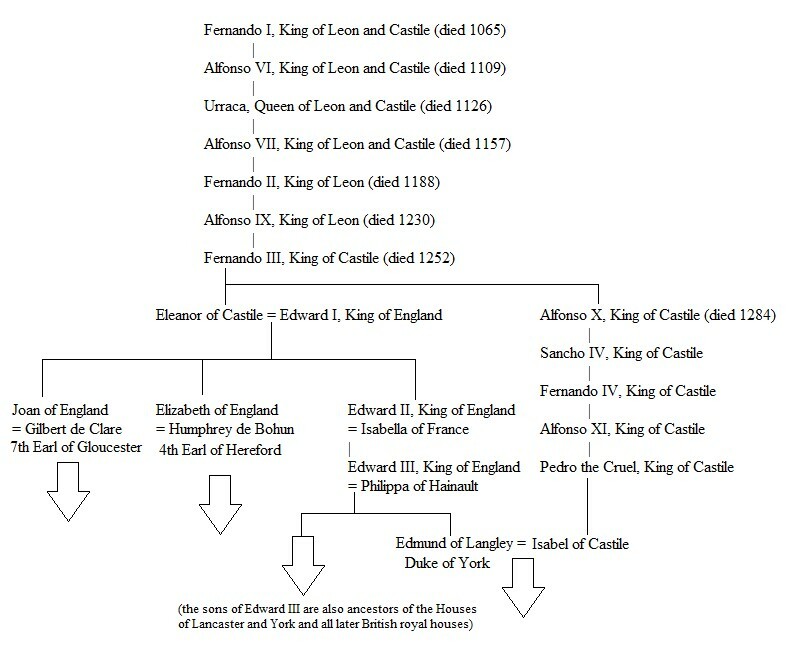 Spanish ancestry entered English lines by way of Blanche d’Artois (died 2 May 1302) the granddaughter of Blanche of Castile who married first Henri I, King of Navarre (died 22 July 1274), they were the grandparents of Isabelle of France wife of Edward II She married second Edmund Lancaster, son of King Henry III. They were the parents of Henry of Lancaster who had at least five children who are the ancestors of Americans. Hi, Chris. Just found your page on the Spanish royal lines. You mention Sancha de Ayala being ancestral to many Americans through her children Constance Blount Dudley and Sir Thomas Blount. There is another daughter not listed in your blog, Anne Blount, who married Thomas Griffith of Wichnor and she is mentioned in the will of her father Sir Walter Blount. Anne’s grandson, Rhys Griffith, was the great-great-great-great grandfather of my mother’s ‘gateway’ ancestor Diana Skipwith Dale of Virginia, daughter of Sir Henry Skipwith, 1st Baronet of Prestwold, Leicestershire (also descended from Edward I and Eleanor of Castile in several lines). Rhys’ daughter Joan Griffith married Sir Lionel Dymoke, 2nd son of Sir Thomas Dymoke, 15th King’s Champion, of Scrivelsby and their daughter Alice Dymoke married Sir William Skipwith of South Ormsby, Lincolnshire and became the great-great grandparents of Diana Skipwith Dale. Just wanted to update this for others who descend from either Diana Skipwith Dale, her brother Sir Grey Skipwith, 3rd Baronet (both from Virginia) or Joseph Bolles of Maine, another gateway from the Dymoke family.